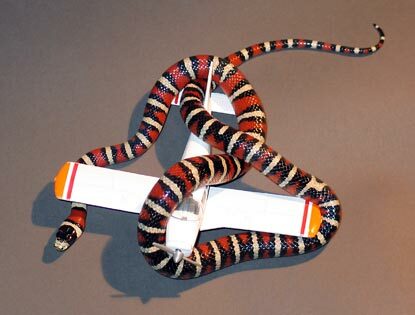 We captured two Sonoran mountain kingsnakes (Lampropeltis pyromelana) on the Labor Day 2005 Gila trip. I gave one to Tom Wyant, head of the Wildlife Center snake rescue program. The other I kept, this small yet very spirited female. Before she escaped (never to be seen again,) I took this picture along with another and submitted them to Defamer.com as artwork for their coverage of the movie Snakes on a Plane. 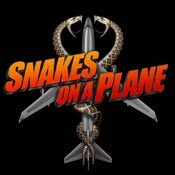 As you may already know or have imagined, it's a horror film where someone releases many snakes on a plane in flight. Mayhem ensues. I am a desert rat in the Middle East in Oman. Being a Muslem country, all snakes R consider'd 'garaam' as in Bad. We don't realy C snakes around here, mayB out in the desert mountain areas, Salala, where one can explore the beautiful 'Green Mountains". MayB it's 2 wet & damp for snakes, don't know. But I do like ur snake pic collection. Pls feel free 2 communicate.